I’m Amy. I started Ideal Protein on May 30th, 2012 at 304.9 pounds. My highest known weight was 327 in September 2006. On May 30th, 2013 I weighed 188.4, for a loss of 116.5 in one year. ! I’m hoping to land somewhere between 160-170, but it’s most important to have a good body fat percentage and overall health. I’m 5’7″ with a medium, fairly athletic, frame. As of 5/30/2013 I’ve lost too many inches to count, 3 prescriptions, 1 cpap machine, and am currently a size 12 (from 26/28W). A blog about who knows what and etc…..What you won’t find here: Recipes not on my diet plan or erotica. All else goes. Now go read the good stuff, because this right here isn’t it. 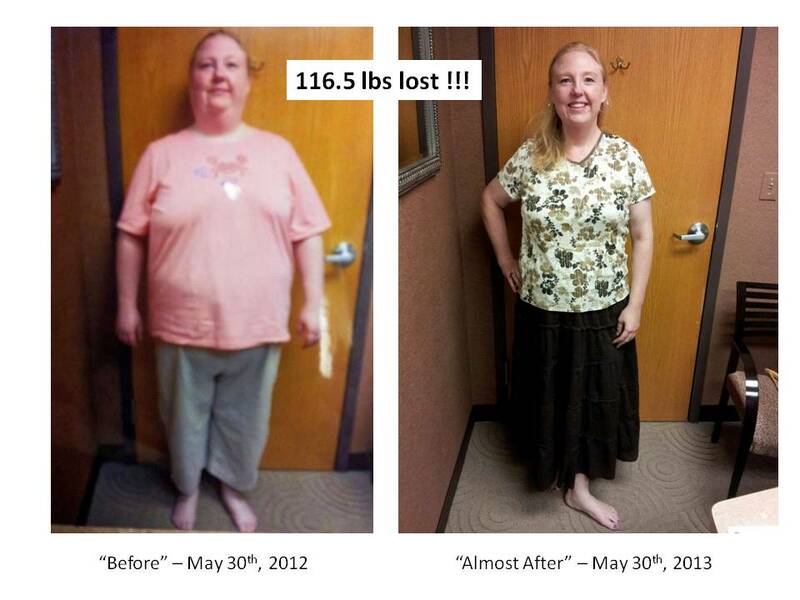 The obligatory Before and “Almost After” pictures…..
Taken at the Ideal Protein office in Palatine, IL. WOW! You look great! What an inspiration! incredible before and after pics! way to go.